It is an individual or family sanitation system which is already a slightly more elaborate in that it allows wastewater to be stored and pretreated thereby providing better hygiene and, if certain precautions are observed, protecting the environment if no public sewerage system is available. It involves digging a small pit in which a tank is built for storing wastewater and sewage which undergo natural chemical reactions providing a first stage in their sanitation. It receives either only "greywater" (household wastewater or sink water) in which case it is known as a septic tank or mini septic tank according to its capacity, or both "greywater" and "blackwater" (excreta, latrines), in which case it is known as a "sewage tank". Stormwater is prohibited in both cases. This technique has been used for a very long time almost everywhere, especially in rural and remote areas, and in countries in both the Northern and Southern hemispheres. The method is relatively simple to implement and can be used everywhere and especially a long way from a sewerage system as it does not require one. It also avoids having to build a sewer system in regions with limited resources. More especially, villages and hamlets located well away from any sewerage system, suburban areas, slums and places where the construction of such a system would be too expensive. Such pits are used primarily to supplement homes. So although the number of beneficiaries is generally quite small, a sewage tank in a village for example can be used as a collective sanitation system (sanitary and sometimes domestic water) for a small school, a community or public toilets. The process involves pretreating wastewater through a settling tank and anaerobic treatment (in the absence of oxygen). There are generally two compartments as shown in the following diagram. In the first case, the solids will accumulate and undergo "digestion" (anaerobic fermentation) which will result in the formation of several gases (CO2, NH4, etc.). The building of a vent for these gas is strongly recommended (see recommendations section). The gas bubbles will form a "cap" or crust on the surface with fine solid particles, with the remainder of these particles being deposited at the bottom. This sludge requires regular emptying (preferably to be done by a professional in view of the risks of infection). The emptying interval depends on the pit volume and use. It should be done as soon as the residual solid sludge reaches 2/3s of the first compartment. Although the second compartment in the example receives decanted effluents, the water leaving the pit is not, however, sufficiently clean. Indeed, only a pretreatment function has been provided (up to 30% of the carbon pollution can be considered to have been removed) ; pathogens remain, including bacteria, in particular. 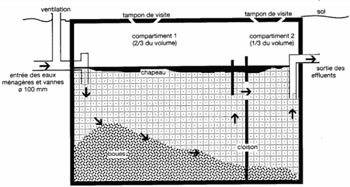 The discharging of such water into the wild or even into a sewer is thus prohibited in many countries, such as France, because of the numerous problems that this may cause (well pollution, unpleasant smells and corrosion due to the pretreatment undergone in sewers). In general, if soil conditions are suitable and the water table is far enough away, the water can be discharged into terracotta drains, soakaways, or spillage trenches. For somewhat more difficult cases, sand beds or filter beds can be used. In even more difficult situations, use must be made of true mini sewage treatment plants provided with bacteria filters, for example. The pit provides effective pretreatment and liquefaction of discharges essential to the water purification phase following on from the pit. It has a fairly long service life : from 10 to 20 years. It can be an economical alternative to sewerage systems in some cases. Septic tanks typically cost more than most individual sanitation systems. A large quantity of piped water is required (at least thirty litres of water/person/day) to flush toilet waste feeding the pit. The water leaving the septic tank is not clean. Indeed, this type of structure only provides pretreatment removing very little, if any, pollution. Bacterial pathogens are not destroyed. It therefore needs to be able to be connected to another treatment system (cesspool or better still an infiltration trench in the ground if there is no sewerage system nearby). Both the construction and the maintenance of septic tanks require specialised labour. Finally, discharges from septic tanks can cause significant health problems for crop irrigation. Many of the problems caused by septic tanks are due to what is often overlooked, namely the treatment of its effluents. 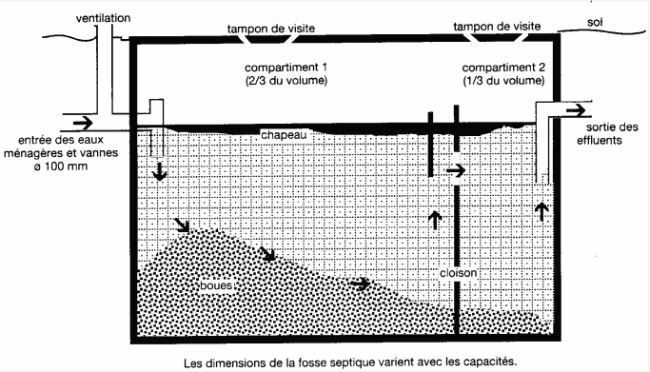 The liquid leaving the pit must be admitted into an ancillary structure (bacteria filters, soakaways, infiltration trenches, filter beds, absorbent trays, etc.) for further treatment respectful of public health. - in northern hemisphere countries, a complete installation of a sewerage tank can cost from €3000 to €5000. However, it is possible to find 3m3 reinforced plastic spare parts for septic tanks for self-assembly for about €450 with a prefilter, as well as 220 l grease separators for €180 and 4m perforated drains for €7. Maintenance and emptying in both cases costs between €5 and €10/year. - The sludge accumulated at the bottom of the tank must be emptied every 2 to 5 years or so for fairly large sewage tanks and every 1 to 2 years for mini septic tanks. This sewage sludge should not be used directly as a fertilizer on food crops, meadows or prairies, or stored near water.
. A septic tank should not be built in a flood zone. - As fermentation produces gas, a vent (ventilation pipe) is highly recommended. This should preferably be installed on top of the roof of the building so as cause no inconvenience and be topped by a static or wind-powered extractor, to generate a suction effect on the gas. - To increase the effects of such a facility, it is sometimes suggested that the person benefiting from one should build the first tank themselves with the help of someone else and then help this other person build their own facility. This website in particular includes the "French-language water-related support centre (RéFEA)", which is a joint website with those of the pS EAU and CREPA (Ouagadougou, Burkina Faso). - SMC Methodological guide (Concerted municipal strategies), published by PDM and PSEau : "Choosing suitable technical solutions for liquid waste disposal", which is a very interesting and informative 136-page illustrated guide produced by GRET, pages 76 to 79 of which deal with mini septic tanks and sewage tanks.